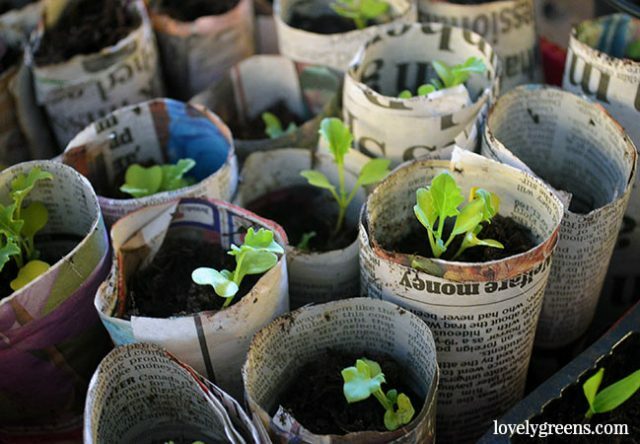 Ideas for starting off your seeds in recycled materials and containers including toilet paper rolls, eggshells, and upcycled plastic cloches. It’s finally getting to that point of the year — seed sowing time. From now until the summer I’ll be sowing a lot of my allotment garden veg at home and then planting it out. 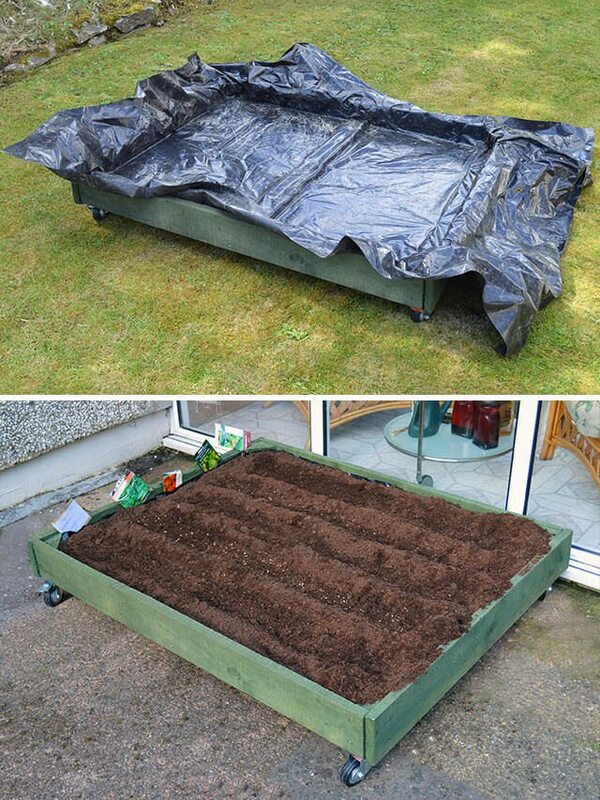 I do this to give my plants an easier, and earlier start in life and to help them avoid slugs and other pests as they’re just emerging. While I do have plenty of purpose-made seed trays and modules to grow them in, I also use a lot of recycled materials. Toilet paper rolls, supermarket veg trays, and egg cartons to name a few. 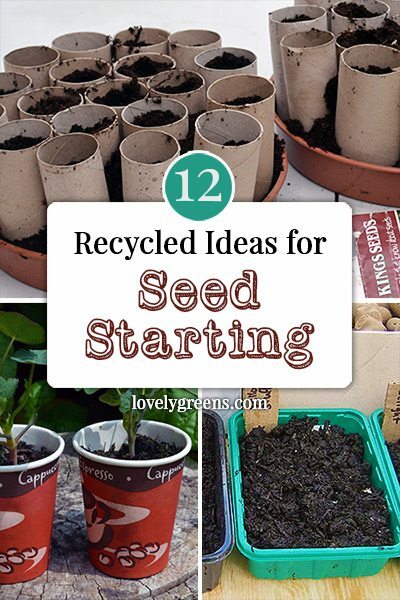 Here’s a collection of ideas for seed starting with recycled materials. They’ll help save you money and reduce waste. 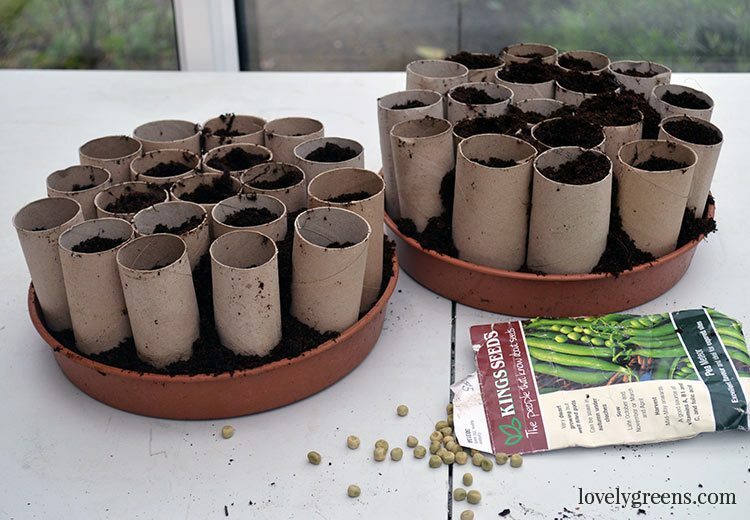 Toilet paper rolls are great for growing most plants but especially ones that don’t like their roots disturbed: beans, peas, and sweet peas. This is because you plant them directly into the soil outside without having to take the plant out. Tip: they may start molding and breaking down before then but it’s nothing to worry about. Also make sure to peel back the tops of the roll before you plant them. This is especially important if you’ve not filled them all the way with compost. You know those plastic trays that you buy mushrooms, strawberries, and other fruit and veg in? Pop some drainage holes into the bottom and they’re great to use as seed trays. They even stack really well together so if you have a bunch, use them one year then clean them out and store them for the next year too. This clever idea from HGTV shows how you can make your paper pots using newspaper and a tin can as a mould. 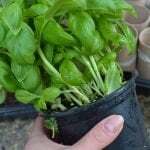 You can also use a Newspaper Pot Maker to make smaller versions. Tip: use both black and white and coloured newspaper for these pots. Coloured ink these days is usually soy based so perfectly fine for the soil. 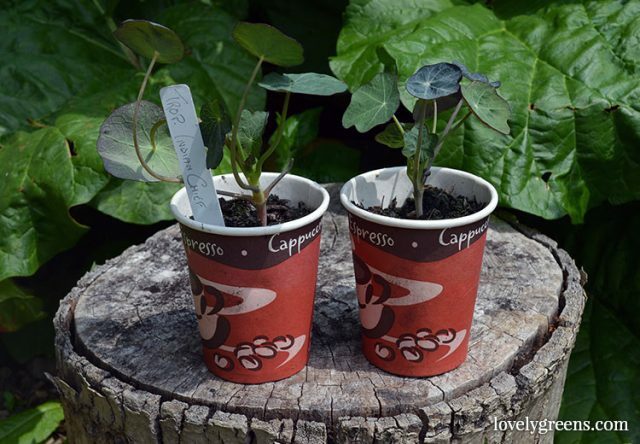 Unwaxed paper cups are perfect for growing plants in. They’re made to contain liquids so are a bit tougher than toilet paper rolls or newspaper so plants can stay growing in them for longer. Make sure to poke a drainage hole in the bottom and your plants will have a snazzy recycled home to live in. You could even stop by a local coffee shop to see if they’d mind you reclaiming some leftover from customers — while you’re there ask if they have spent coffee grounds too since they’re great to use in the garden and in making compost. If you’re starting seeds that need a bit more warmth, consider popping them into a pastry clamshell. 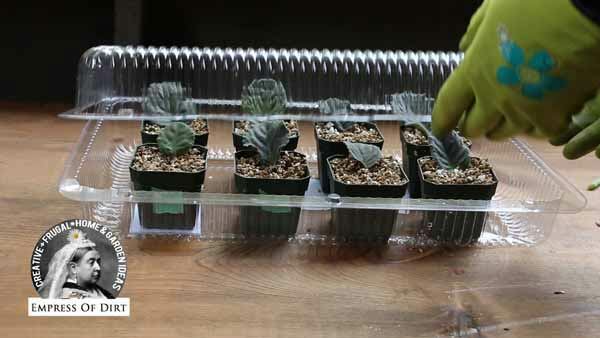 This tutorial from the Empress of Dirt shows how she uses them to keep her African Violet cuttings warm and cosy. This is an idea from an allotmenteer here on the Isle of Man. I’m not sure where they got the large water bottles from but the bottoms have been removed and they’ve been converted into cloches. 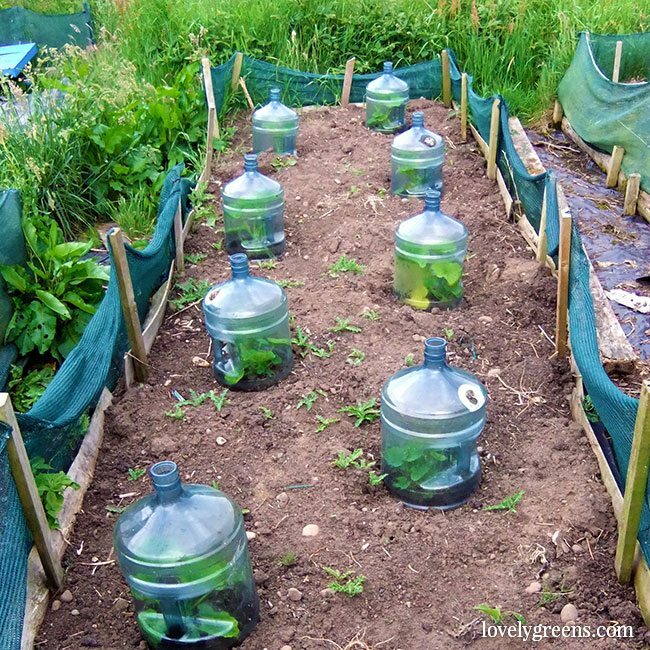 Cloches are like mini greenhouses that are fitted over individual plants in the garden. They keep the plant warm and help protect it from slugs and snails. 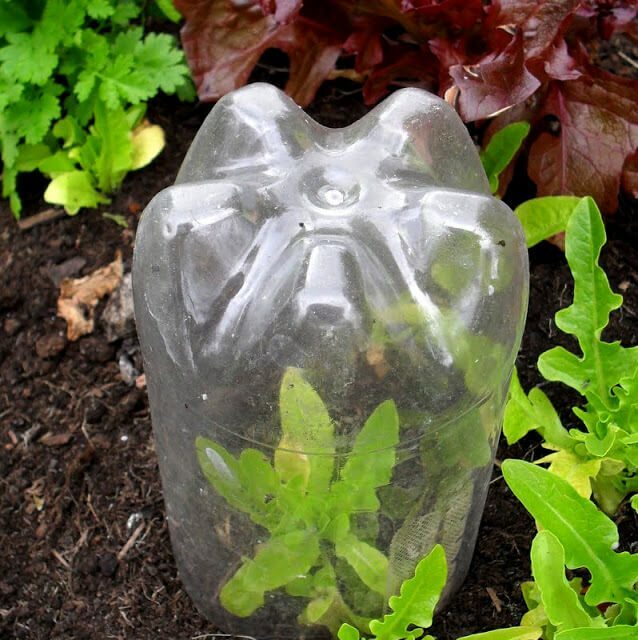 There’s also a clever way to make recycled gardening cloches over in this piece. Not everyone has access to large water dispenser bottles but they might have plastic drinks bottles. 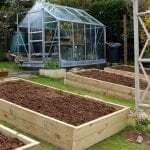 These can also be converted into cloches either like the photo above or buy using the top so there’s a bit more ventilation. This image and a lot more ideas can by found in ‘Gardening on a Budget‘ written by guest writer Elaine Rickett. Tip: try to use the clear bottles since darker ones can block out some of the light. 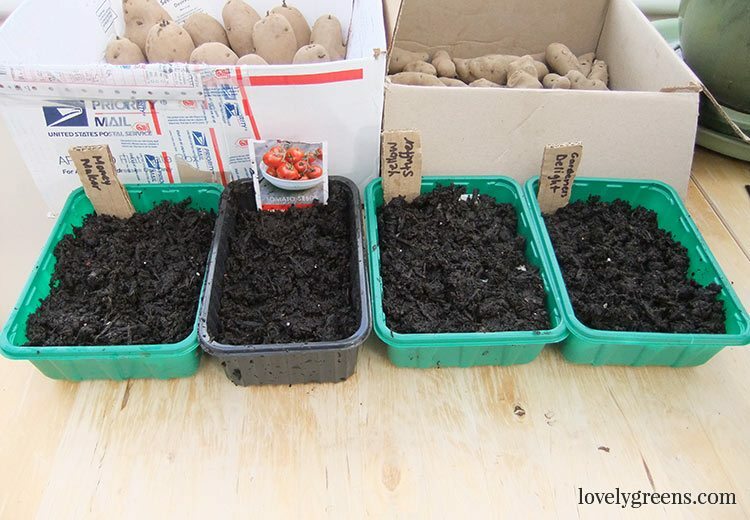 Now that it’s warming up you can begin sowing seeds outdoors. 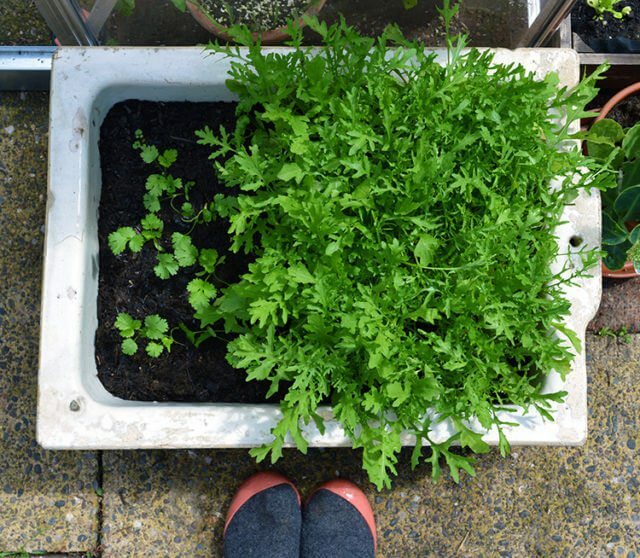 I have several recycled and upcycled containers including an old Belfast sink that I grow Rocket (Arugula) and Coriander (Cilantro) in. Since it already has drainage by means of the drain, I’ve just filled the bottom with gravel, topped it up with soil, and it’s now a perfect planter. You could up-size this idea by planting into an old bath tub. A wooden pallet can easily be converted into another style of outdoor upcycled planter. All you need to create this Wheeled Pallet Planter is one wood pallet, 4-5 Caster wheels, a few other materials, and some basic diy skills. It’s a great mobile planter for salad crops, leafy herbs, and other shallow rooted crops. 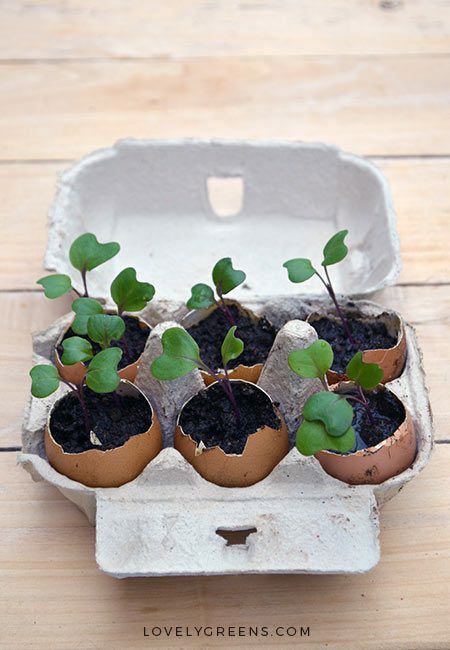 Not only do these eggshell planters look incredibly cute but they too can be planted out directly into the garden. Just make sure to gently crack the eggshells before you put them in the soil. 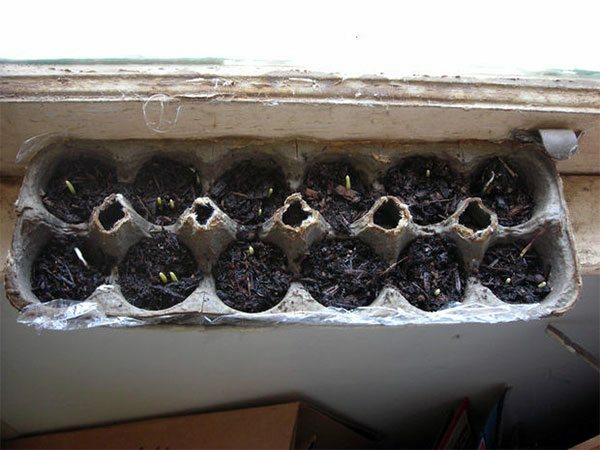 Once you’ve had your omelettes and planted up your eggshells you can use the egg carton to sow even more seeds! Each egg cup can be filled with soil, sown with seeds, and then ripped off and planted directly in the garden. Like toilet paper rolls, the paper breaks down making this growing idea from Instructables very handy indeed. One of the easiest ways to save your own tomato seeds is to scrape them out onto a paper towel, goo and all. 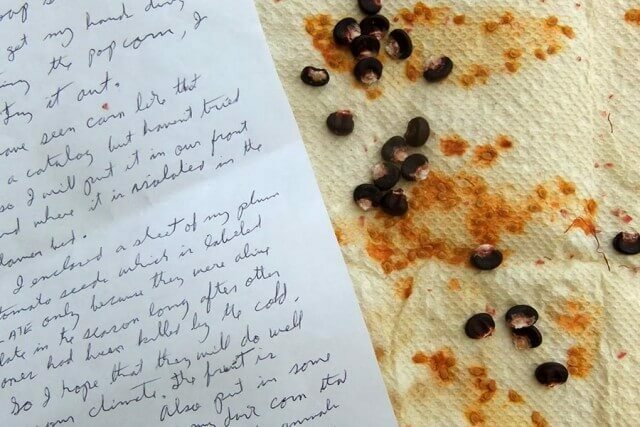 Let it dry completely before storing it away or sending the seeds to a friend. When you’re ready to sow them, you tear or cut off a piece of the paper towel and plant it with the seeds into the soil. Here’s more on how that works. Love this post Tanya! 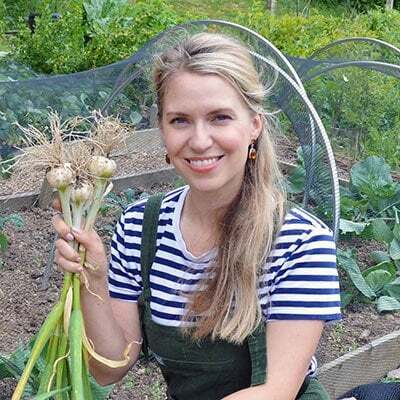 I also believe that gardening doesn’t have to cost and recycling in a contemporary world is not a choice but a must if we want to look after our environment. 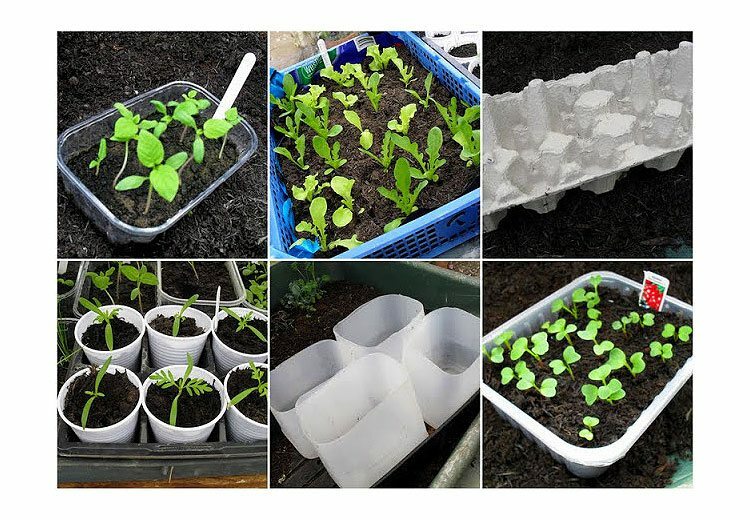 Great ideas here- I have successfully planted seeds in old mushroom containers, transplanted seedlings into cardboard tubes and old plastic cups. You’re well ahead of the game Hema — it’s great to hear that other people are actively recycling in their gardens too!